Obtain insights on the benefits that eLearning offers, what ROI is, how you can measure it, and the ROI methodology you can use. 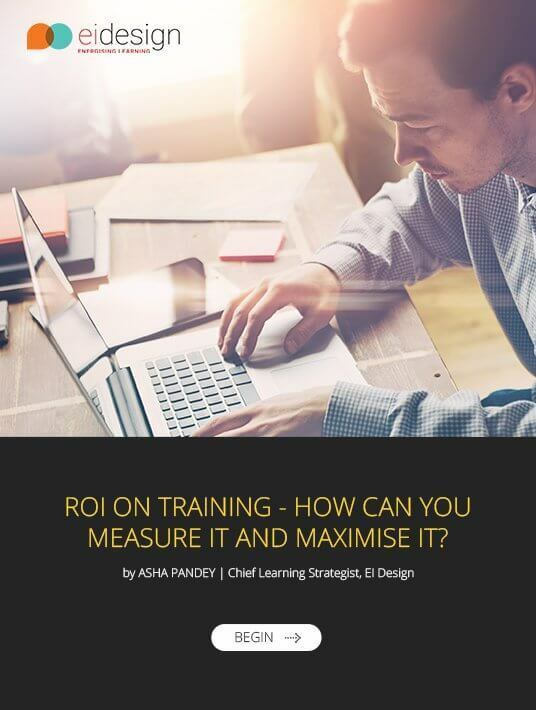 Get wiser on maximizing the ROI of your training initiatives with 6 useful tips. Know how you can use Performance Support Tools to enhance the learning experience of your training and your ROI. What is really important to note is that measures to maximise ROI must not be handled in isolation. Instead, they need to be an integral part of the cycle that begins with your Training Needs Analysis (TNA), determining the training format (online, blended or ILT), learning strategy and evaluation. No online training course is effective unless it brings a significant ROI. EI Design’s exceptional eBook presents surefire ways to measure and maximize ROI. It also showcases how Performance Support Tools enable online learners to apply what they learnt.